Darkwave has never sounded cooler than when Amelia's Fault is behind the wheel and then when you put the immaculate Andreas Öhrn of Gravitonas on the record and you've got a track that is near perfection. Driving beats and haunting vocals create an atmospheric event unlike the majority of mainstream artists producing music right now. I have images in my head of cold stone walls with barely lit gas lamps providing dull illumination but in the corner of my eye, I see something darting in the darkness. It's a reflection of the loneliness we all feel at time to time, the fact that we do what we can to stand out and stand apart but we don't seem to live up to our own expectations let alone others ideals we have fostered upon ourselves. Introspection and Self Reflection are two tasks that most of us aren't the best at doing and when we have to take a look at the choices we make, there are times when it's easier to just fade into the shadows rather than stand in the harsh light of day and take a good look at ourselves. When you have a production team that has been doing this as long as the guys behind Amelia have been, it's no wonder that there is not one misstep on this track. It's got a gorgeous beginning, middle and an end. It builds where it needs to and it's quiet in the spaces inbetween. It's not overworked and it's not tortured. It's the perfect combination of creative vision and execution. If they continue working this way, it's going to be very easy to say that when the full album comes out, they will have a massive property on their hands. Never ever going to turn down a video from Penguin Prison. And this official video for "Golden Train" is here. This man has a groove that is so inherent in everything he does, it's not funny. This is one of my favorite tracks off his 2011 debut release. It's just a funky dance track that builds into this amazing party in of itself. It has a fantastic beginning, middle and end and is done right. There aren't many artists out there that can do what he does in the confines of 4 minutes or less. I've talked about how amazing he is and how cool his music is in the past. And as much as I appreciate this video, what I would LOVE to hear from him is new material. This track has been bouncing around for a while now and a new album or EP would be incredible. Wow. Simply wow. I am late to the game again. Frida Sundemo is slaying me with this song. It starts of super crispy with this crazy beat and then this freaking tweaked out sax hits you. And that's all it takes to make me a believer is adding a sax to a track but then this beat that is just hammering all the way through the song is CRAZY. It just thumps through the whole track and hits you in the chest. But then magic happens when she starts singing. She has this tiny voice that is GORGEOUS and she just takes the lyrics and makes them hers and never ever lets the track get the best of her. It's not until the first chorus where you actually realize that this song is a freaking love song and it's amazing. It's melodic and it's magical and it's sweet and it's what a love song should be. I've listend to it over and over and the lyrics just get right to the heart of you. And then song ends just the way it came in. Packing up and taking it's things with it, but leaving this mass of feelings in it's wake. She is my new favorite artist. I totally missed this back in July and for that I am damn sorry because that's 5 months I could have been obsessing over it. I think when this came out, the press was hot and heavy over Steve Grand and it was just eclipsed by that press machine but I think this song will stand the test of time and will be around for quite a while. It has enough of pop rock anthem and sensibility that if it were marketed correctly, it would be MASSIVE. This song is built amazingly. The hook and the chorus are super catchy and don't get me started on how well Eli slays these lyrics. It's a gorgeous song and it needs to be a number one hit. It's not pretentious and it's just an honest to goodness love song that has absolutely no ulterior motive. It makes you feel something and that's important. Eli's voice has a rough hewn edge to it that adds to the gravity of the song and gives it more weight. The production is incredible and it's just an amazing song. Simply, amazing. Are you tired of just reminiscing about how great Kraftwerk and Nitzer Ebb were and want to hear something that takes that feeling but modernizes it? Just Like Humans is a project created by San Diego producer, Kevin Hartmann that taps into his musical roots based in early 70s and 80s electro and creates something that is familiar but new at the same time. It is an easy fit into the Retro Future movement that is happening right now and will make any Gen Xer electro fan the happiest person you've seen them in a while. The EDM scene right now is so full of people that go out and purchase some software and cobble a couple of not so great tracks together but it still takes a massive amount of talent to use that software and use it well. This album isn't just a rehash of things you've heard before and it's not all loops and samples, it's a carefully crafted album that when you sit down and listen to the tracks, you get a fully realized concept that has a bit of edge to it and in some places; a bit of darkness and unease. Not super creepy but enough to think that this maybe the music that Skynet enjoys listening to. I think that Just Like Humans is one of the more inventive groups that have come on the scene and I'm super happy to have found them. This album is fantastic. There isn't a track on it that's not put together well and exceptionally thought out. It's music like this that inspires me and makes me realize how important music is and how even electro has the ability to generate emotions and feelings when it's done well. It can paint pictures and it can make you remember things or daydream. For example, "Individual Throttle Bodies", a song that I didn't even see the name of until after my first listen made me think of this super cool car chase scene but in a sci-fi movie in the 80s. Let's go back and add a hyperreal chase to Blade Runner with this as the soundtrack. Go follow him on the various social media outlets listed below. Take a look at his birthday suit on Instagram :p And more than anything, support indie artists because they are the ones that are actually scoring our dreams. Every so often, the stars are aligned and you are at the right place and time for something incredible. In this case, I was ready to bring one of the most amazing bands into my life. Now I know how corny that sounds but I when music is as big of a part of your life as it is mine, milestones can absolutely be measured in albums and artists. There is an amazing New Wave revival happening right now and there are so many bands that are making incredible synth pop that will have a place in the music pantheon for years and years to come. 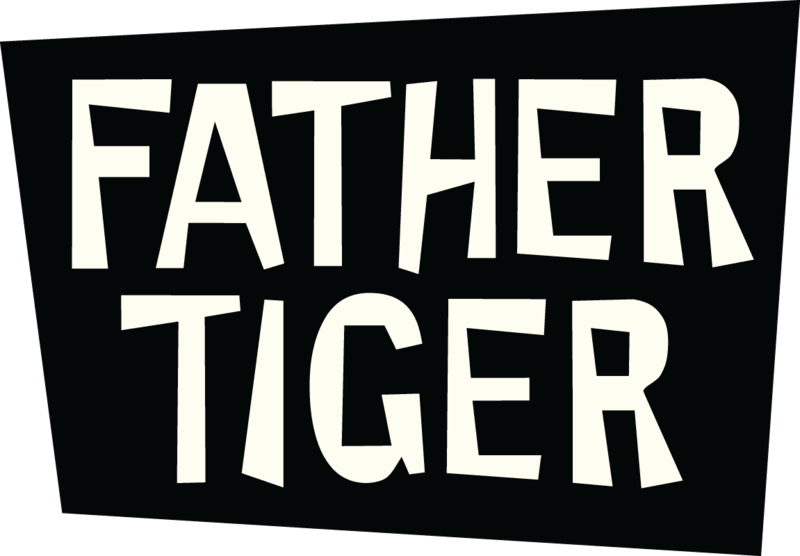 A band that has carved out a place in history is Father Tiger, an LA based band made up of Greg Delson and John Russell. Not only do they create amazing synths and beats and melodies but the lyrics that are written are absolutely amazingly heartfelt and earnest. Not one lyric sounds forced or out of place and when you listen to the songs you can tell that every song is painstakingly crafted and worked until perfect. They've released 4 albums, one of which are some of the most amazing covers I've ever heard. Greg's voice has the ability to take the simplest turn of phrase and inject so much emotion that you have to stop for a minute and just let everything process. I am in awe at the level of talent these two men have and how effortless everything sounds. People have drawn references to so many other artists, Pet Shop Boys, Erasure, Information Society and more but when it comes down to it; Greg and Russell are their own men and have created their own sound. You can hear beat that makes you say, oh...that sounds like... but it's nothing more than paying reverence to those artists that came before. I don't think they sound like any of those artists directly. Their subject matter runs that gamut from first love to saying goodbye and everything in between. The tracks range from upbeat that will have you dancing at first listen but when you go back and listen to them again, it's the intelligence and thoughtfulness that they've written into the tracks that give them staying power. But then there are amazingly beautiful ballads and songs that speak to the human condition and the heart. They've got two albums that are as different as Summer and Winter cleverly, the tracks mirror those seasons. Vernal Equinox is fun and happy like the spring. It's new and it's fresh like the world walking up again for another year. But don't be deceived because the songwriting shines through the amazing brass and percussion. These tracks just make you feel good all over and the come to a head with "First Love", a gorgeous song about that first time you know. No doubt in your mind, you just know. But like all first loves, it comes to an end. You look back at it realize how much work you put into it and see where you are at today and it kind of leads right into Winter Solstice. Winter Solstice is a little bit heavier, a little darker. The songs blow in like fresh snow and tend to be a little more on the melancholy side of the heart. It's the necessary dichotomy that makes these albums coalesce in a perfect balance. I have to say, this is my favorite of the albums right now because I am more able to relate to the feelings these songs bring up. But don't think this album can't bring the heat. It opens up with the gospel. "Head Hung Low" will take you straight to church and make you testify. I have to say that my favorite of all the tracks that have been released is "Still With Me". It hits very close to home and I know exactly how the character in the song feels. I identify with the song more than I have any song in a long time. The way the chorus just comes out of nowhere and is just aggressive gives it so much of an edge. "Done" is another gorgeous track. The lyrics are just stunning. The song is amazing. E.P 1 and Summer Solstice are also beautiful albums and stand on their own merits and have tracks like "Right Now", "Shell", one of the most amazing covers of "Set Fire to the Rain" I have ever heard. I bought these albums last week and I've not stopped listening to them since. It's very easy to see how they are going to stay in heavy rotation for a long time. The only thing I'm sad about is that "High Road" isn't available for purchase. Listen to that track, it's incredible - the demo and the acoustic version. They've also generously donated proceeds from the purchase of their tracks, "First Love" and "Right Now" to Marriage Equality so that one day, we all can have the same protections under the law. Go listen to their music. Go to their shows. Buy their merch. Go buy their music. Support independent artists so they can keep making music.